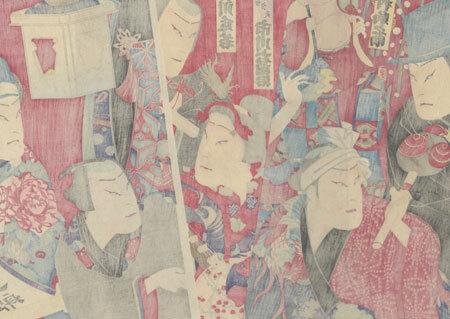 Comments - Handsome example of a kabuki triptych by Sadanobu in the rare full oban format. Most kamigata-e or prints produced in the Osaka region are chuban size, so larger format works are unusual. Here, seven actors stand in for Japan's famous Seven Lucky Gods. 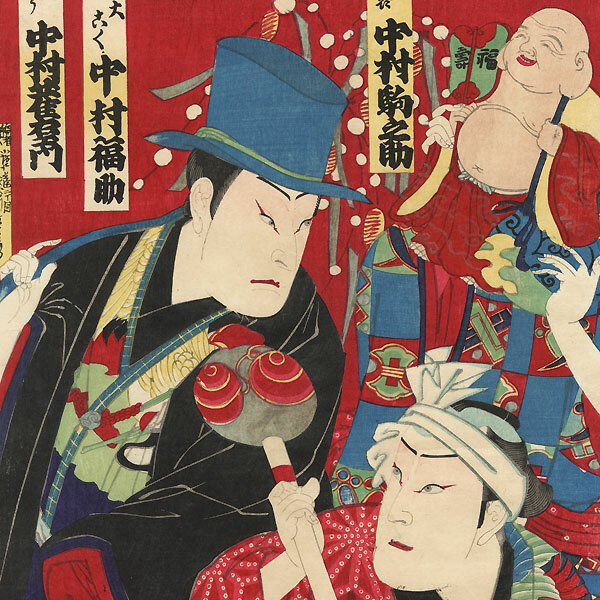 In the center, a beauty portrays Benzaiten, while the fellow in green at lower right represents Ebisu, his folding fan patterned with the red snapper normally carried by Ebisu. From left, the actors are Nakamura Jakuemon, Nakamura Fukusuke, Nakamura Komanosuke, Ichikawa [? ], Jitsukawa Enjaku, Arashi Kitsusaburo, and Jitsukawa Yaozo. A great design with expressive figures and rich jewel-tone colors set off against a deep red sky. Beautifully detailed with burnishing on the black robe at left and the black kimono collars, a burnished geometric pattern on the black kimono at top center, and touches of metallic pigment that have oxidized to a dark tone. Condition - This print with excellent color and detail as shown. Three separate panels. A couple small holes, a couple small losses in margin, repaired. Slight soiling, a few creases. Please see photos for details. Good overall.